Lacrosse, one of the fastest growing Team Sports in North America, is a Great place for young Athletes to learn important Life Skills, while having a fantastic time. On top of the obvious Physical Fitness benefits, there are few Sports which promote Team Work and Cooperation like Lacrosse. In Box Lacrosse, all players are a part of the game at all times. When on offence, the team works together as they move the ball trying to get a good shot on the Goal. When on defense, it is vital that the Team works as a unit to protect their Defensive Zone and not allow a good shot. This is contrary to some sports where some young athletes may be left out of the action. Lacrosse inherently rewards Teamwork and smart play. The size and strength of the athlete is less important than the heart that He or She plays with. Quickness and Agility are definite assets to the Lacrosse Player, but equally important is the ability to Adapt and Read the Play. While Lacrosse currently offers little Financial Reward compared with some other popular, commercialized Sports, it does offer opportunities to young athletes in the form of Scholarships, particularly to US colleges where Canadian Box players often excel in their Field Leagues. Athletes who are active in other sports may find Lacrosse to be a great way to combat Burn-Out while cross training and developing skills that may not get enough work when practicing in one field. Do you know someone who would like to see this information? Maybe co-workers in your Break Room, Friends from the gym, your Dentist? 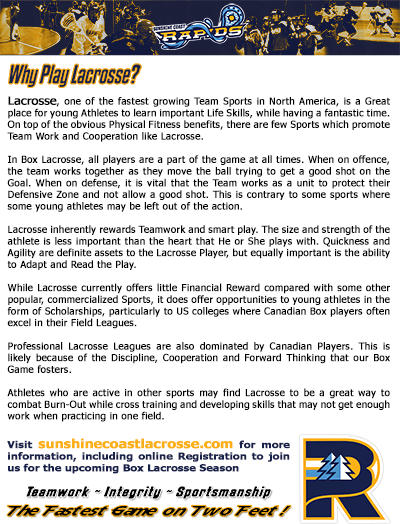 Please Download our Why Play Lacrosse Brochure and post it somewhere others will see it. Help spread the word about Our Game.